Imagine you’re a cow, you have to go on slaughter-house-safari, you escape from your own death, you flee to the woods, where they still try to hunt you down, the media gets this cow-escapes-slaughterhouse-tip, within no time you’re all over the cover of magazines and on the front pages of every newspaper, you suddenly have your own hashtag, you suddenly got more than 1 hashtag around the world wide web, then there is this defined benefit plan to get you to a real ‘Cows Rest House’, and the whole country has gotten crazy over you and raised €50.000 for you to retire there, which makes you now the most discussed cow ever in history. Imagine this is all true. Then it means you’ve become a celebrity cow who escaped her own death. Yes people living outside the Netherlands this happened in our tiny dot on the world map. 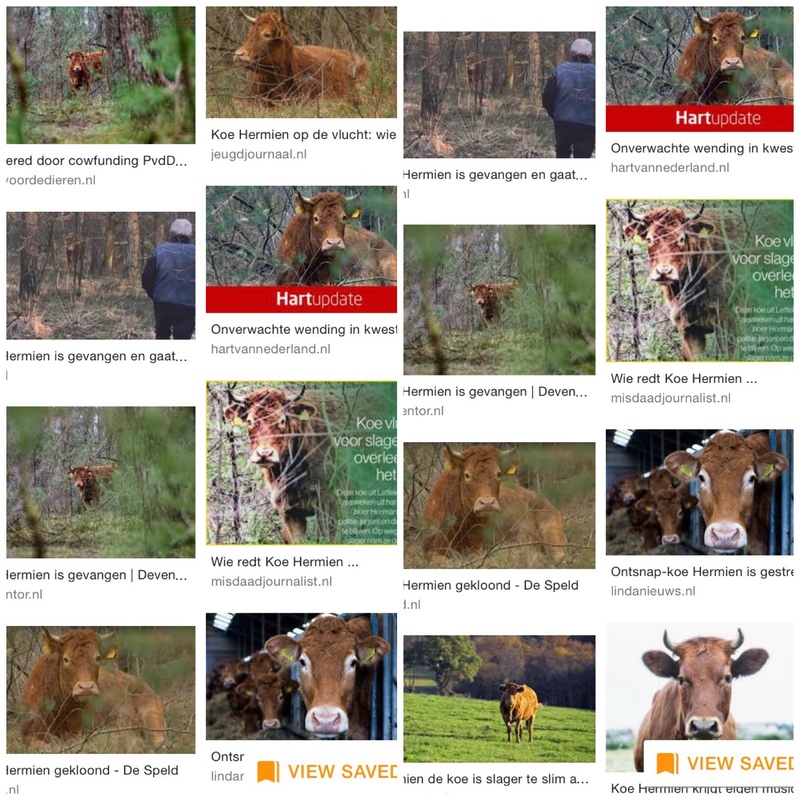 Apparently we have such love for living meat clumps that we even have this political animal group in this country who launched a crowdfundings action for Hermien the escaped-from-slaughter-cow and successfully raised €50.000 for this holy cow. Meant so the poor sweety don’t end up on your Big Mac, but gets this carefree life in an animal retirement rest home together with her sister who also escaped. If circumstances are all right cows can live even for 20 years and taking care of such a bestial creature cost €160 per month. If we have to be happy with that I dunno because now knowing Hermien; she and her greasy sister are most certainly going to paint the town red everywhere and nowhere. Catching Hermien, who became instantly famous in Holland and gave the whole country (well ‘whole’; only 16 million people) a huge find-Hermien-fever. This tiny country now woke up every morning, except those who were up all night searching for the Buffalo like beast, and all ignored their mobile phones to start defecting Hermien and checked every nook and cranny. The entire country was out of order; nobody went to work, there were no trains, no schools and there was even not one selfie taking person to ne noticed; it looked like the whole country wanted cow Hermien to have a peaceful continuation of the rest of her life. Well maybe there were a little fewer people involved in the search action, but enough to get the entire population discussing the whole meat-girl-cow on the internet which even left many hamburger-fans embarrassed and immediately most of them called for a meat-chew-strike. Do you know what: we also have a cow whisperer in the Netherlands. Yep, he considered that until now people didn’t handle it very well. According to him there was no need to use doctors and hunters to catch Hermien. You only need one simple cow to lure the beast. But that was not really necessary at all since Mrs. Hermien apparently has some sort of University degree herself. Late at night multiple times she went on Tea Wreath at some local cow farm and after a couple of hours she returned to the woods in the darkness where is she finally got anesthetized and caught by veterinarians. She had been wandering in the woods for two months and now it was time to intervene because she cost danger on the roads. As said on social media cow Hermien had a lot of support from meat eaters as well as non-meat eaters. Well the non-meat eaters is no surprise but the meat eaters must have been drinking too much probably. Apparently the animal was much smarter than human beings because she only came forth when there were no hunters in the neighborhood. I think it shows she definitely got a bunch of brains. The assistant Professor of animal ethics and animal welfare in The Netherlands did comment it’s a noble endeavor to have started this crowdfunding, but there are other cows too: what about them? Now Hermien is the only one with a face and she is spared and the other animals go to the slaughter that’s not fair. Read also: A Dutch cow has escaped from a slaughterhouse and everybody is going crazy about it!